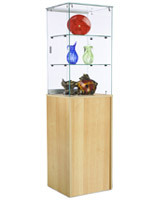 Need an attractive showcase with a small profile? 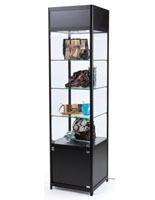 These square tower display cabinets fit compact floor space in boutiques, home dens, jewelry and gift shops, lobby areas, schools, museums, and sports or event venues. 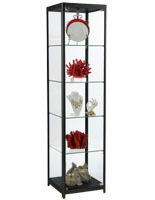 Racks like these look great in the corner or center of the room. 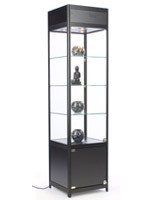 These display cases can hold fragile artifacts, expensive items, precious memorabilia, hard-won trophy collections, rare photographs or hand-made exhibits. 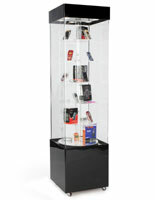 These showcases keep their contents safe with their strong tempered glass and melamine construction. 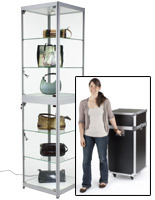 These versatile showcase units are made for use against a wall or out in the open. 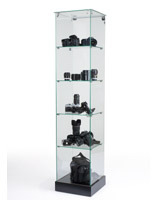 What kinds of features do these square tower display cases offer? 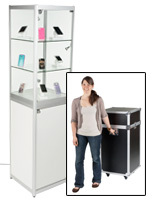 Each stand features a full 360° of visibility. 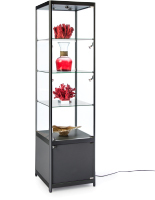 Their tempered glass panels create a secure and noticeable showcase. 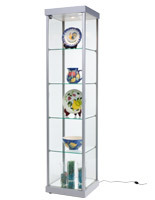 These curio cabinets require little floor space, measuring 15" to 20" wide. 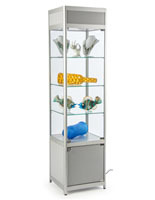 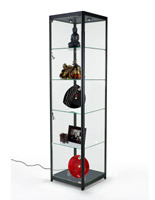 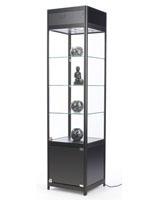 This type of tower display case comes in a variety of attractive finishes and designs. 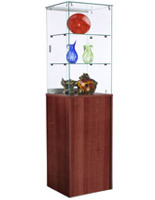 Available colors include black, cherry, silver, white, maple, oak and rosewood. 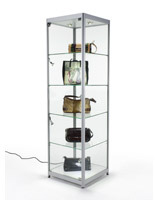 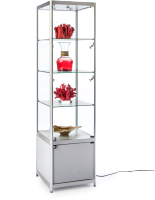 Tower display cases have the option of wheels on the bottom, locking glass doors, halogen illumination, adjustable glass shelving, and tempered glass viewing areas. 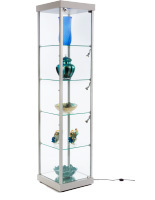 Styles range from contemporary minimalist glass to conventional molding-trimmed wood. These glass trophy cabinets cover a range of prices to accommodate every venue and budget. 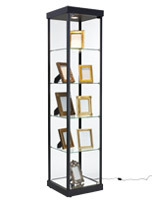 What can these display cases be used for? 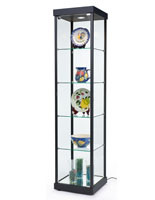 In homes, they can be showcase antiques, heirlooms and other artifacts in a living room or den. 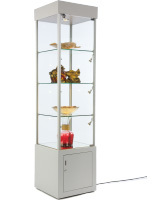 Residential users can choose cabinets with a wood finish to go with their décor. 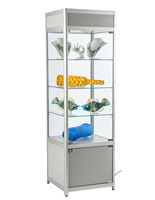 Retail stores can use them to showcase all kinds of items from expensive jewelry to model cars in their strong tempered glass fabrication. 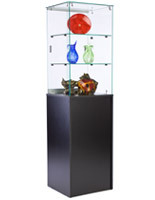 Models with top or side lighting will create an attractive showcase that will draw in customers. 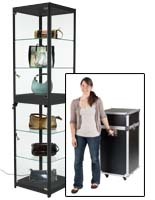 Schools can place these racks in hallways or classrooms to feature trophies, awards and students' projects in a compact area.